A major advantage of Sellsy's cash register is to easily identify or add customers to your CRM, directly from the store interface. The easiest way to do this is to use the pop-up confirmation window when issuing the receipt. This window gives you the ability to send the ticket by email to your customer. Simply enter in their email in the appropriate field. If the customer exists, the ticket will be directly assigned to them. If they do not exist, a new customer will be created in Sellsy. 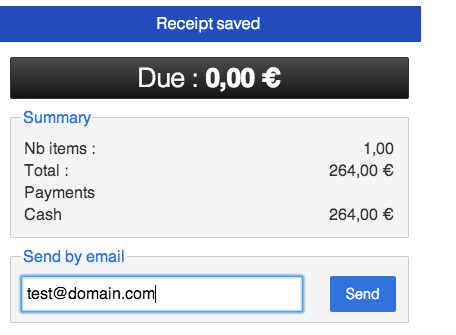 You can link a customer while creating the receipt. To do this, before registering payment, click the Customer Link button. In the next window, enter a portion of the client's name, his email, or phone number, and select from the list.